I am BEYOND excited to announce what is my most EPIC adventure to date! And I do mean EPIC! I’ll be cycling the Iron Curtain Trail (EV 13) 1600km across Finland! As a bonus, I finish in Nuorgam, the most northern point in Finland and in the EU! To see my latest posts about Adventure Cycling to the Most Northern Point in Finland scroll down on the right. I’ve been to Finland three times. The idea came to me last summer when I was exploring the outdoors along Finland’s west coast. I had the opportunity to explore Kvarken Archipelago, Finland’s only natural UNESCO site and a kayak or canoe lovers dream, the remote fishermen’s island Maakalla,where time seems to have stood still for the last 100 hundred years and Liminka Bay, the #1 birdwatching spot in all of Finland! 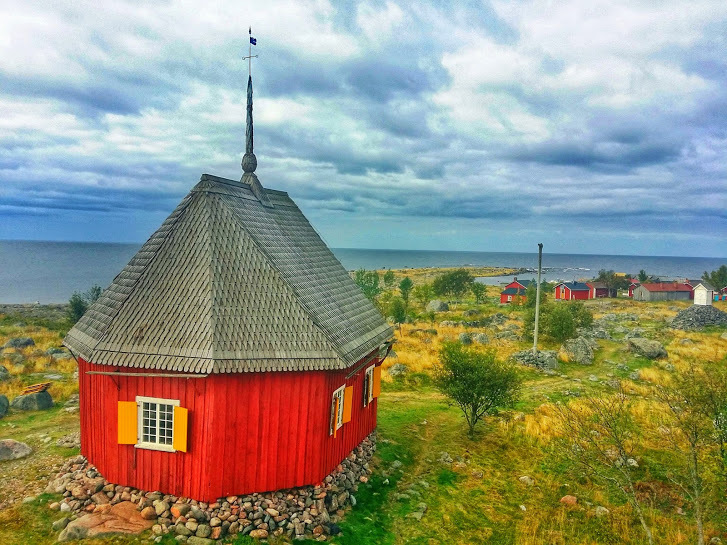 View over Maakalla island and Finland’s smallest parsonage, which is built in the shape of a boat. The more time I spend in Finland, the more I realize that many of us, don’t really know what adventures await us in Finland. When you think of the best places for adventure, Finland, probably doesn’t make the top of your list. Not because it doesn’t deserve to, but because we don’t know. I would like to change that! When I’m in Finland, I feel a sense of peace and a connection to nature. No doubt a direct effect of the fact that almost 70% of the country is covered in forest and 10% of it is comprised of lakes for a grand total of….wait for it….187,888 lakes! Generally speaking, Finns are introspect. Many of them choose to spend their summer holidays at their cottage, often in remote places, away from everybody. I grilled a local on my last visit upon visiting a cottage; How long do you stay here? Some people stay the whole summer, others just a couple of weeks, but in general, we like to stay for as long as possible. What do you do? We relax, enjoy nature, or go for a swim. It’s very lowkey. Do you socialize with the neighbours? We say ‘hello’ to each other of course, but the point of coming to your cottage isn’t to socialize with your neighbours, it’s to be with your family, and to enjoy nature. This conversation left a lasting impression. It fascinated me that a whole nation values nature so much and the solitude it brings. Iwould go stir crazy, relaxing at a cottage for a month, but I love the idea of being in nature and being in solitude. That’s where the idea of cycling the Iron Curtain Trail (EV 13) came in. The trail is either 1550km long, or over 1742km long depending on the source. It runs from the northern end of eastern Finland, where it meets the Norwegian border, all the way down through eastern Finland to the Gulf of Finland in the south. It’s part of the international Iron Curtain Trail in which Europe was divided into the east and west. According to the official Iron Curtain Site, The Iron Curtain Trail invites people to retrace and experience the former division of the continent on a 6,800 km cycle track along the length of the former border, combining European culture, history and sustainable tourism. I’m hoping to cycle alongside reindeer! In 2005 the European Parliament named it as a model for sustainable tourism. Sustainable tourism is an issue close to my heart. I’ve been fortunate enough to visit rural villages across Europe, speak with travel industry professionals and have seen with my own eyes how sustainable tourism can provide a much needed source of income for local villages, allowing people to stay in their village if they choose, instead of moving elsewhere for work. It’s my sincere hope that by cycling the Iron Curtain Trail in Finland, that I can increase awareness of some of the remoter regions in Finland, and encourage more tourism. Note, I’ll be starting in Savonlinna, a region that boasts the largest lake district in all of Europe! This means I will miss the first 266km of the route, butadd in a few extra kilometers when I visit Kenestupa and Utsjoki which are off the Iron Curtain Trail, located at the top part of the map of Finland! Day 2:Train from Helsinki to Savonlinna, hopefully participate in a seal safari! Along the way, I’ll be stopping to visit war museums, memorials, old wooden churches, and even have a few wildlife encounters including a seal safari, and a bear and wolverine hide! It’s my mission to uncover the best of what eastern Finland has to offer and to promote sustainable tourism in the region. I will cycle by Lake Inari in Lapland, and maybe even go for a swim! So am I scared? Hell ya! I don’t remember the last time I had butterflies this bad! I choose to do this precisely because it does scare me! Until 6 weeks ago, I hadn’t cycled more than 25km! I did cycle 340km along the Donau from Passau, Germany to Vienna, to prepare. Fortunately that went very well, but I did that with 2 people and I’ll be cycling the Iron Curtain Trail alone! It’s pretty easy to follow the Donau – it’s the second longest river in Europe! I think I’ll be in for more of a challenge with the Iron Curtain Trail. Raija Ruusunen,the Project Manager for the Iron Curtain Trail in Finland gave me three maps and advised that I should upload them to my Garmin. Sounds good! Except for the fact that while my husband has a Garmin, I’ve never actually used it! I have excellent navigation skills in the mountains, but terrible in cities. I have no idea how I’ll do on a bike, but I’m about to find out! Furthermore, I injured my hand when cycling the Donau and have a compressed nerve which has abruptly ended my training on the advise of my doctor. I’ve been running instead, but am under no illusions that 30 minute runs are going to compensate for proper cycling training. My mechanical abilities are not the greatest and while I’ve helped change a flat tire, I’ve never actually changed one myself. Given that a good portion of the route is above the Arctic Circle, it’s safe to say that I’ll be doing it alone, when the time comes. My hotels are all booked, now I just have to find them. Even Finland’s Everyman’s Rights which allows you to camp almost everywhere, couldn’t convince me that camping was a good option, with additional gear required. Finally, how will I deal with the loneliness? Or the bad days, when there is no one to cheer me on? I’ve done long distance hiking excursions before, but never alone. I will need to be my own cheerleader. But as scary as all that sounds, it’s also what puts a fire in my belly! I plan to meditate everyday before starting out, have compiled a killer play list of my favourite songs when I need pumping up! It’s as much as a mental challenge as it is a physical one! Plus, I’m inspired to bring awareness to these remote areas in hopes of encouraging more cyclists to visit some of the remotest regions of Finland promoting sustainable tourism! I know that my cycling trip in Finland, will look much different than when I went cycling in France. I also want to hear from you! What do you want to know about cycling the Iron Curtain Trail in Finland? Do you have any suggestions of must-sees for any of the places I will be visiting? Or even better, do you want to join me for a few hours of cycling? And yes, I’m serious! Even if you decide not to cycle with me, I hope you’ll join me vicariously through this adventure cycling! It all starts May 30th! Follow along with the hashtag #AdvFinland on Facebook, Twitter or Instagram, or bookmark this page for easy reference. I’ll be posting all my social media updates along the way here. Blog posts will have to wait until I come back. Trust me, I don’t think I’d be able to write any blog post of real value to you after a day of cycling 100km! Further information on cycling in Finland by Visit Finland. Thank you to Visit Finland and to the Iron Curtain Tail – Finland for making my visit possible. As always, all opinions are my own. The Iron Curtail Trail? This is VERY EXCITING, Laurel! I'm quite impressed that you're taking on this challenge and riding solo. I wish you the very best. Yes, I plan to experience it vicariously thru you. Finland is indeed a lovely place, one that I've been fascinated about since I met and became friends with a few Finns - and promised to visit. Looking forward to learning more about Finland through you. Have fun! I wish you all the best for your cycling adventure. Wish I could join you! Really interesting way to spend a vacation with something different to do every day. @Martin - Thank you so much. It was fantastic! @Marcia - Thank you! I am VERY excited! I wanted to do something that I knew would definitely challenge me and that was out of my comfort zone and this is definitely it! I'm much more of a hiker, than I am a cyclist. This will be my third trip to Finland and I can't wait to explore the eastern part and Lapland! WOOOO, Laurel! Have a good safe ride and journey! I can't wait to see the landscapes as you head into "endless summer"! @Jenny - I loved it! Your trip sounds amazing! Enjoy! Have fun in your amazing challenge. May you make it with ease. And the people of Finland sound so lovely. I would love to checkout this magnificent land someday. @Tajirul @Thank you! I had a wonderful time. It was challenging at times, but SO worthwhile! As always you post very interesting and worth reading articles! I really enjoy that! full of information! I am sure you will have a wonderful experience riding in Finland I married a Finish girl some years ago and spend every summer riding in different parts of the country I will be traveling back to Helsinki this year either June or July one thing I would like to mention make sure you have plenty mosquito repellent with you the whole time . Stay safe ! @Stuart - Thank you. I loved it. Cycling was such a gorgeous way to experience Finland. I was really lucky, no issue with the mosquitoes at all, I think it was too early as I was there in June. Lucky you that you spend so much time in Finland. There's so much to see.